Jupiter Mines Limited is an ASX listed mining company based in Perth, Western Australia. 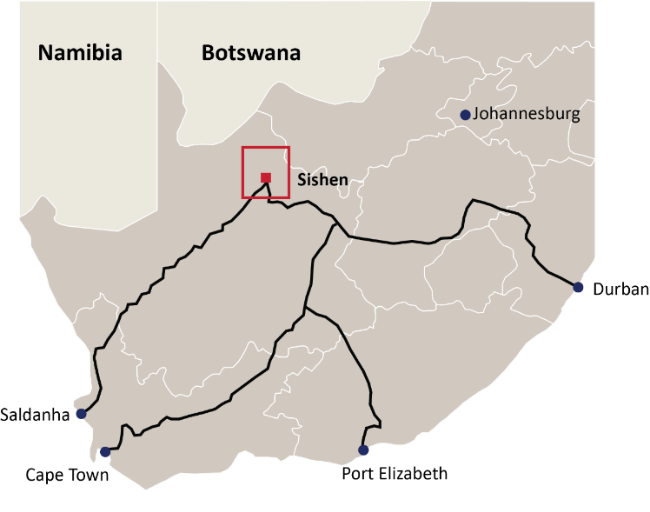 Jupiter’s flagship investment is a 49.9% stake in the Tshipi Borwa manganese mine, located in the manganese rich Kalahari Manganese Field in South Africa. Tshipi is independently operated and managed, and black empowered. Jupiter also has two iron ore development projects in the Central Yilgarn Region of Western Australia, being the Mount Ida Magnetite Project and the Mount Mason DSO Hematite Project. Two major projects are currently underway; Tshipi Manganese Mine and the Central Yilgarn Iron projects. The Central Yilgarn Iron Ore Project (CYIP), located approximately 110km northwest of Menzies, provides Jupiter with exposure to several 100% Company owned iron ore exploration prospects in close proximity to established road and railway infrastructure. The CYIP covers approximately 490 square kilometres and consists of two project areas; Mount Ida and Mount Mason. 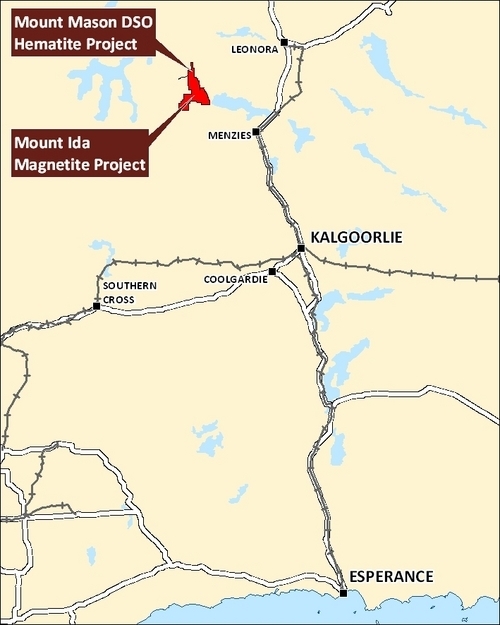 Scoping Studies completed in 2011 on the Mount Ida Magnetite Project and the Mount Mason DSO Hematite Project indicated that the projects were financially robust. Both projects are planned around existing infrastructure in the region, including the Leonora to Esperance railway line, and the Port of Esperance. Jupiter completed the Mount Mason Feasibility Study in Q1 2012, with further optimisation work undertaken in 2014, until the project was suspended due to economic conditions and infrastructure access, and placed into care and maintenance. The Mount Ida Feasibility Study commenced in Q2 2012 and was based on annual production of 10 million tonnes a year of beneficiated magnetite grading +68% Fe. Work on the Mount Ida Feasibility Study was suspended in 2012 also due to economic conditions and infrastructure access, and remains under care and maintenance. Mr Gilbertson was appointed as a Director of the Company on 22 June 2010. Mr Gilbertson has extensive experience in the global natural resources industry. He was Managing Director of Rustenburg Platinum Mines Limited in the 1980’s, a period during which the company gained recognition as the world’s foremost producer of platinum. In the 1990’s, as Executive Chairman of Gencor Limited, he led the restructuring of the South African mining industry into the post-Apartheid era, transforming Gencor Limited into a focused mineral and mining group. During this period he held ultimate responsibility for Impala Platinum Holdings, for Samancor Limited (the world’s largest producer of manganese and chrome ore and alloys) and for Trans-Natal Coal Corporation (a major coal producer and exporter). Important new initiatives included the Hillside and Mozal aluminium smelters, the Columbus stainless steel plant, and the purchase of the international mining assets (Billiton plc) of the Royal Dutch Shell Group. In 1997, Gencor Limited restructured its non-precious metals interests as Billiton plc. With Mr Gilbertson as Executive Chairman, Billiton plc raised US$1.5 billion in an initial public offering on the LSE, taking the company into the FTSE 100. Separately, Mr Gilbertson worked to merge the gold operations of Gencor and Gold Fields of South Africa, creating Gold Fields Limited, a leader in the world gold mining industry. He served as its first Chairman until October 1998. In 2001, Billiton plc merged with BHP Limited to create what is widely regarded as the world’s premier resources company, BHP Billiton plc. Mr Gilbertson was appointed its second Chief Executive on 1 July 2002. In late 2003, Mr Gilbertson led mining group Vedanta Resources plc (Vedanta) to the first primary listing of an Indian company on the London Stock Exchange in the second largest IPO of the year (US$876 million). He served as Chairman of Vedanta until July 2004. He was appointed President of Sibirsko-Uralskaya Aluminium Company (SUAL), the smaller aluminium producer in Russia and led that company into the US$30 billion merger with RUSAL and the alumina assets of Glencore International A.G., creating the largest aluminium company in the world. Mr Gilbertson established Pallinghurst Advisors LLP and Pallinghurst (Cayman) GP L.P. during 2006 and 2007 respectively, to develop opportunities on behalf of a group of natural resource investors, which currently own 86% of Jupiter. Mr Gilbertson is the non-executive chairman of Pallinghurst Resources Limited, a company listed on the Johannesburg Stock Exchange (JSE: PRL) and is a director of various companies controlled by PRL. Mr Gilbertson is a British and South African citizen. He has not been a Director of any other ASX listed company in the past three years. Paul is a founding director of Jupiter Mines Limited and was Chairman at the time of formation in August 2003. Paul was appointed as a Director of the Company on 20 August 2003. He has served continuously since that time as Chairman of both the Audit Committee and the Remuneration and Nomination Committee. In addition to attending to various statutory duties as required, Paul has a strong record of attendance at Company board and shareholder meetings and contributes to consideration and discussions in respect of matters on the Company’s business papers. Apart from academic qualifications which are relevant to his roles, Paul has held positions on boards of a number of ASX listed companies. Mining experience includes exploration for and mining of tin in the New England district of NSW and service on the boards of successful Australian oil and gas companies, Basin Oil NL and Reef Oil NL. Mr Heo was appointed as a Director of the Company on 4 February 2019. Mr Heo is the President of POSCO Australia Pty Ltd, a significant shareholder of the Company. After joining POSCO in 1995, Mr Heo worked across the strategic planning and raw materials areas. Mr Heo brings significant experience in the resource industry to Jupiter. Mr Bell was appointed as a Director of the Company on 4 June 2008. Mr Bell is Chairman of Red Rock Resources plc, and Regency Mines plc, being companies listed on the AIM market of the London Stock Exchange Ltd. He was a natural resources analyst in London in the 1970s, then specialised in investment and investment banking covering the Asia region. He has been involved in the resource and mining sectors in Asia since the 1990s, and has served on the Boards of a number of listed resource companies. Priyank Thapliyal was appointed as a Director of the Company on 4 June 2008. Priyank joined Sterlite Industries in 2000 and worked alongside Mr Anil Agarwal (owner) to implement the strategies that led to the creation of Vedanta Resources plc, a FTSE 100 company. Vedanta floated on the London Stock Exchange (LSE) in December 2003 and raised USD 870 million in its IPO, in what was the largest mining IPO on the LSE that year, and also the first primary listing of an Indian company on the LSE. The success of the Vedanta IPO was instrumental in other emerging market mining companies seeking LSE listings. Subsequent to the LSE listing, he led Vedanta’s first major overseas acquisition via the USD 50 million controlling investment in Konkola Copper Mines (KCM) in Zambia in 2004. At the time of his departure in October 2005 to co-found Pallinghurst Resources LLP (Pallinghurst LLP), the KCM stake was valued at USD 1 billion and Vedanta had a market capitalisation of USD 7.5 billion. Priyank has been instrumental in delivering Pallinghurst LLP’s steel feed strategy via Jupiter. That has led to the creation of the flagship Tshipi Mine, from what was a greenfield project, into one of the largest, long-life and low-cost assets of strategic importance. Prior to Vedanta, Priyank was a mining and metals investment banker with CIBC World Markets in Toronto Canada, is a qualified Metallurgical Engineer, MBA and former Falconbridge employee. Ms North was appointed as a Director of the Company on 14 March 2019. Ms Melissa North joined Jupiter Mines in May 2012 as Group Financial Controller and was subsequently appointed CFO and Company Secretary on 15 November 2012. Prior to joining Jupiter, Ms North held various roles in finance management and business advisory services over almost a decade, including Group Financial Controller positions within the Chime Communications Group (London) and other large media agencies in the United Kingdom. Ms North qualified as a Chartered Accountant in 2004 after extensive work experience at Grant Thornton Perth (now Crowe Horwath). Over her time with Jupiter, Ms North has played a critical role in the development of Jupiter, culminating in its ASX listing in April 2018 and in its subsequent evolution into a successful ASX300 company.